Target AFR for very high boost on 93 Octane? - Miata Turbo Forum - Boost cars, acquire cats. Target AFR for very high boost on 93 Octane? Ok so I have a whipple SC, intercooled, running 23 PSI. I'm currently running 11.0:1 AFRs in boost, I'll post my AFR table below. I'm about to order a new pulley and raise the boost to 30 PSI, the limit of the SC. My question is, should I keep the 11.0:1 AFR target running 30 PSI on pump gas? Or should I add more fuel at very high boost? 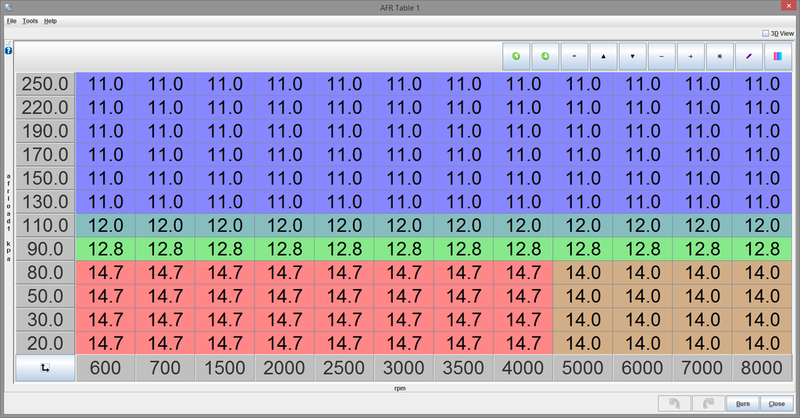 VVT motor, 9.0:1 comp, head and block shaved a touch (est 9.5:1 comp at the most). With higher boost RPMs will be limited to around 8,000-8,200 as I don't want to overspin the blower. Goal is for the car to be reliable, and not break/detonate. Reliable first, power second. What AFR should I tune for in high boost? It will obviously depend on a bunch of other things, but I don't really see any reason to run so rich in the 110-180kpa range. Past that, sure (again, depending on lots of things). Though you probably shoot past 150kpa so fast that you'd likely never hit specific targets there anyway. Basically it seems a lot of people don't run crazy boost on pump gas anymore, so finding what AFRs people run at high boost seems hard to find. Also because of the SC, the highest boost will be at the highest RPMs. So it might only make 20 PSI at 5K, and 30 at 8K for example. So maybe 11.0:1 AFRs are okay at 5K/20 PSI, but at 8K/30PSI I should run more? I dunno, thus this thread! Pretty much what I was thinking, he's probably not in that region long enough to matter. You could probably lean it out a few tenths, but if the car is responsive with the current tune I wouldn't bother. Is there a reason you're not running E85 at this point? Granted, this is a completely different motor but I've seen some Mitusbishi Evos running large amounts of boost (20+ PSI) on 91 and up top they usually are around 10.5 to 10.8 AFR. IIRC, stock Evos run around 18-21psi stock too. He doesn't have easy access to the stuff. If he did, it would rock his world. I'm running 93 Octane pump gas only, yes there are reasons for this. My question here is what AFR should I run for 30 PSI on 93 Octane pump gas. Thanks for the info on 20+ PSI Evos running 10.5-10.8. That's the kind of info I'm looking for. Also LOL at whipple, they don't have the pulley I need, so I'm about to have to order an even smaller one.... Jesus I'm gonna be running all the boost, probably more than 30. Yeap. When it's easily available AND someone here figures out a proven/easy way to run an E85 sensor have have a completely flex-fuel add-fuel-and-drive setup, then I'll for sure jump on the E85 bandwagon. Till then, it's pump gas for me. Totally understand on the pump gas choice, just curious. I have an E85 station less than 5 minutes from my house, so I just run it all the time. If it wasn't close I probably wouldn't either. Stock Evo 8s and 9s are PIG RICH, out of the box they run low 10s AFR in boost and dangerously lean out of boost for emissions. For under 20psi you probably can run low 11s, but with the S/C I'd want extra fuel to cool it down. 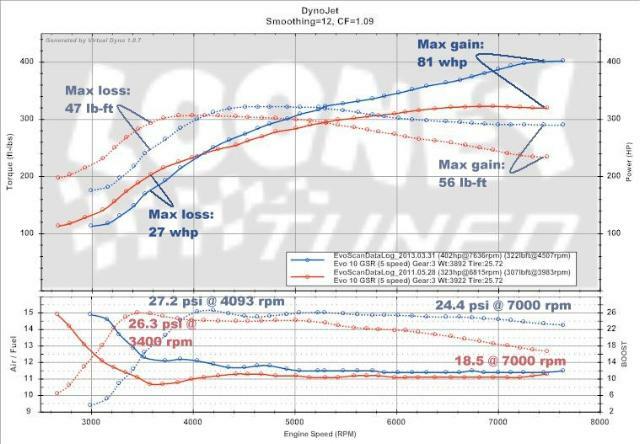 Here is a Evo X on pump gas running 27psi before and after tuning. Looks like low 10s in boost once it settles. Yeah 10's for both evo and subaru. though the evo could always go leaner than the scoobs. ignore oem mapping, it's terrible on both for smog reasons. But really, you'll need to consider all the variables and not just think of a number cause others use it. it will depend a lot on AIT's and the quality of 93 you're using, how well your system is breathing and how knock prone it is. But really, you'll need to consider all the variables and not just think of a number cause others use it. it will depend a lot on AIT's and the quality of 93 you're using. Ok so if you were tuning a BP that was running 30ish PSI on 93 Octane, what AFRs would you shoot for? I don't know exactly since I don't have the new pulley yet. What compression ratio are these evo's running 30 PSI? Yes it's pretty much a guarantee my AITs are higher, this SC dumps a lot of heat into the charge. I have a big IC but still air temps go up quick. A 1-2-3 pull is usually starts with AITs about 10 over ambient, ends with them 50-60 over ambient and climbing. My setup breathes fairly well for a BP. The cams and header are about the only real bottlenecks in the system. I'm thinking I should probably get the AFRs in the mid 10's by the time I reach peak boost. So maybe 11.0 at 20 PSI, but 10.5 by 30 for example. Or maybe even more? Also for the subarus and evo's, are they running 10.9's, or more like 10.0's? Yes I want conservative, this is a street car not a race car. I want it to be as safe as it can reasonably be. This is what I'd shoot for, I like fudge room instead of a blown motor. Stock Evo 7-9 motors are 8:8:1.
but honestly I'd not even compare to them because evo's flow a metric crap ton and make absurd power with low timing and sky high boost and ej's are a completely different, finicky beast that relies more on timing and is very knock prone/fragile. Since you're making high boost so high up I'd be more worried about your rods and valvetrain than running too lean. Yeah this motor is 9.0:1, probably a touch over since the head has about 10 thou off the head, and the block I dunno but probably similar. Only comparison is just to have an idea. I think for the BP, I'm gonna need to run richer than any evo at the same boost since BPs are much more knock-prone. There just aren't a lot of people running high boost on pump gas posting about how they tune, so I need something to go by! On my old turbo, GT3271, I ran 28 PSI with 11.0:1 AFRs, but I always had the timing very soft. One day I threw 2 degrees and the car felt like it gained 40-50hp. I took it right back out but it was obvious I was leaving power on the table back then. I think now getting in most of the timing is important, so it seems I may need to run very rich for knock suppression so I can get the timing in I need to make the power. That's what I'm thinking. I got carrillo H-beams with carr bolts, and the supertech catalog for the valvetrain. That should be covered. This motor has seen 8,700 already with 23 PSI, this valvetrain on my last motor saw 8,800 prob 200 times, and when I checked the valve lash it was just as I set it when I built it, checked the valves and they don't leak. So I know the head is ok, and the bottom end should be. Also with new pulley, looks like I'll have to drop the rev limit to ~7,700 to respect the RPM limit of the whipple. So high RPM won't even be a problem now. Quick Reply: Target AFR for very high boost on 93 Octane?